We’re already saving hundreds of thousands of South Africans hundreds and thousands of Rands every year. And all we had to do was look at how the car insurance model was broken, factor in the role depreciation plays in your car’s value and how this relates to your premium. Whew, now that sounded like a bit of a mouthful. Basically, we’re no strangers to checking out the little things that impact your car and as a result, your car insurance. That’s why the king decided to take another steely-eyed look at the depreciation of cars. His royal grey cells clicked and whirred until he cottoned onto yet another TA DA moment. He thought… What if you could get cover for the actual car parts that depreciate over time and avoid paying for repairs and replacements out of your own pocket? Well, now you can with our royal warranty cover! Here’s the skinny on the WHAT, the HOW, and WHO. A big motive behind warranty cover is to help you avoid unexpected costs and ensure that you’re not driving around unable to fix your car if any parts have failed. Ultimately, we want to prevent the amazing humans in this country driving problem cars and getting into sad and traumatic accidents on the road. We’re all heart and all about saving you (money). 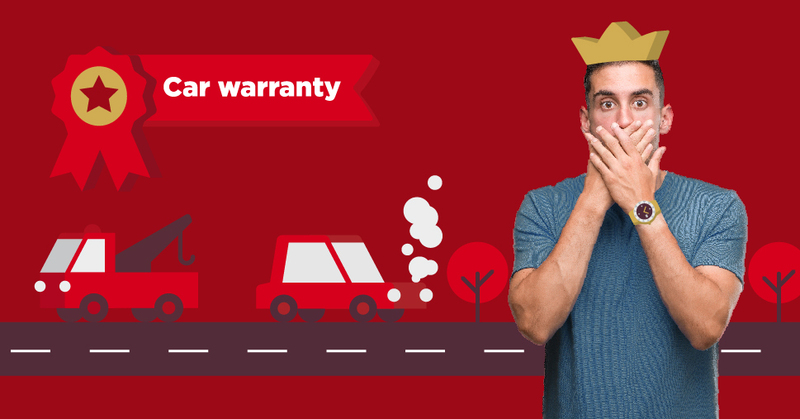 The king’s warranty cover pays for car part repairs or replacements if they fail unexpectedly. It’s not just the bits and pieces that we’ll pay for, but also the cost of labour and associated outwork. To make sure that everything is above board and excellent, all repairs must be done by 1 of our royally approved repairers. When something goes bang! You just need to contact us and we’ll help you take it from there. We’ll even pay the repairer directly, so the money part won’t ever be a stress on your awesome shoulders. And all this is in exchange for a supremely low monthly premium. Well, who can get it? Absolutely everyone who owns a physical car (no dream cars allowed, alas). Your car doesn’t have to be insured by us… Or even insured at all. You will, however, need to have a full service history of the car and you’ll need to be a permanent South African resident. It really is as easy as that. You + RSA residency + car + full service history = eligible. This revolutionary product can help you save money… It could even save your life. And the cherry on top is the fact that the whole process is quick and easy to check off your admin list. Oh, and don’t forget that the whole time you’re dealing with anyone from our kingdom, you’ll be treated like absolute royalty. We’ve won awards for how well we treat our clients, and we want to keep that reputation up… Yup, you’re in for quite the experience. Get a quick warranty cover quote here or call our royal client care team on 0860 50 50 50.